Dischidia astephana is found in Malaysia, usually at higher elevations on Leptospermum trees. It is one of the 'ant-plants', where a mutualism relationship is assumed for the plant and the ant. 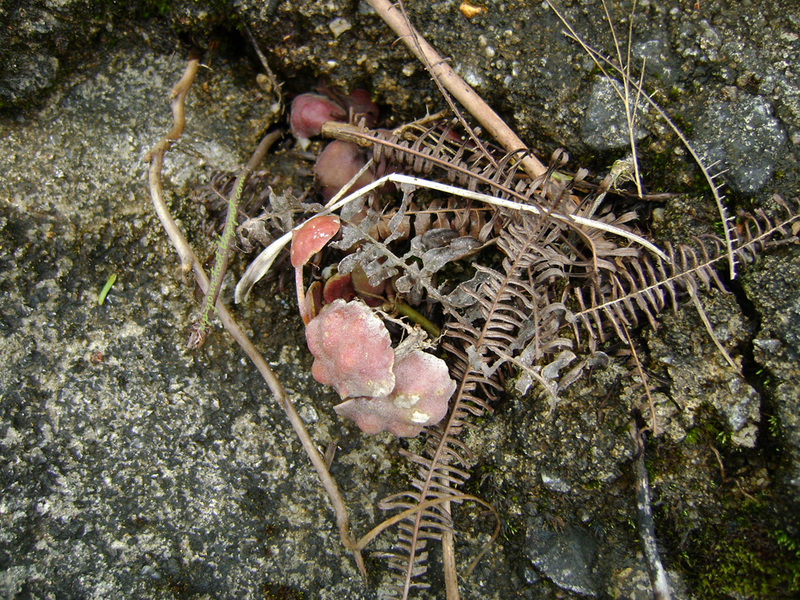 I spotted the Dischidia on the ground, on broken twigs when I was showing people some Nepenthes of Genting Highlands at elevation of around 1405m above sea level. The warty leaves of Dischidia astephana. The blue arrow points to a cluster of flowers that I didn't notice at the time of taking the photo. 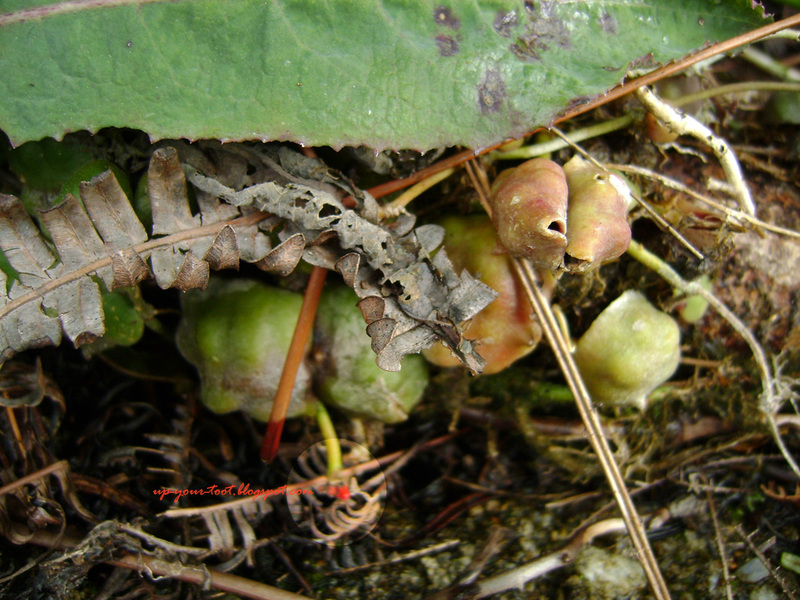 There were no longer any ants associated with the Dischidia for this specimen as the twig had fallen to the ground. The warty bullate leaves and the closeness of the leaves (imbricated leaves) seems to point to D. astephana. Leaves that were exposed to sun turn a pinkish red colour. 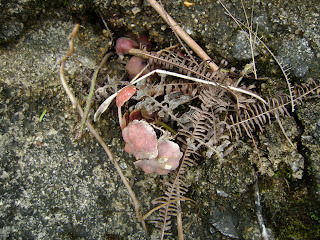 Reddish pink leaves of Dischidia astephana that has been exposed to strong sunlight. As I did not spot any flowers when I first saw the plant, I half-heartedly snapped a few photos (hmm, cannot ID so no point to take photo). Only when I got back and reviewed the picture did I noticed that there were flowers on the plant. You can just see the red/crimson buds at the bottom of the picture, out of the plane of focus. So it has got to be D. astephana. 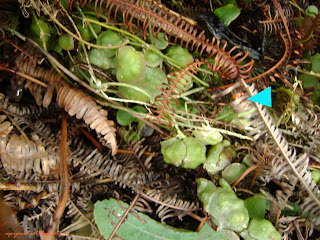 Dischidia astephana - note the reddish crimson flower at the bottom center of the picture (highlighted). The leaves that were exposed to strong sunlight take on a pinkish red colour. It is quite a cool ant-plant, though they are said to only grow well when associated with the ants (Crematogaster). J.S. Weir & R. Kiew believed that the plant actually wins it all, i.e. it is not a mutualistic relationship, but a 'I win it all' relationship for the Dischidia with the host tree and the ants. What is its common name in bahasa? D. astephana doesn't appear to have a specific Malay name. Others depending on the species, are called kantung rezeki (for those that have a pouch) akar bani or akar banok/akar kul. They belong to the milkweed family, and hoyas (wax plants) are their closest relatives.